Galganov's Free Recipe for GREAT, Red Cole Slaw! Add mayonnaise (start with 1/4 C) and papper (starting with 1/4 tsps. Taste and add additional mayonnaise and/or pepper a little bit at a time - mising very well until the slaw sugguests just the ring creaminess and "pepper" tang for your taste. You can add more pepper later (ie, the next day) but you can't take it out. The pepper taste will enhance a little as the cole slaw ripens/ages. Coleslaw is best after it has sat for a while (rpened). Make some in a pinch - or prepare it and let it ripen a day or two, in the fridge, before serving. Cole Slaw ... cabbage salad. 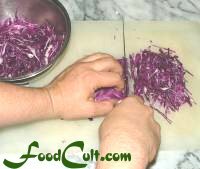 Red cole slaw is wonderful and peppery and creamy and so high in fiber. Red is probably the easiest of the cole slaws to make with its simple, few ingredients. There are only three ingredients and none of them are salt. This dish is salt-free! This recipe is particularly easy to expland or contract. Make a quick, one-serving portion to go beside a piece of meat or make up a big batch for a party. It's all pretty easy!